It has been awhile since my last post. I've been busy, but I've also tried a couple new recipes that just weren't very good, so I didn't bother posting them. 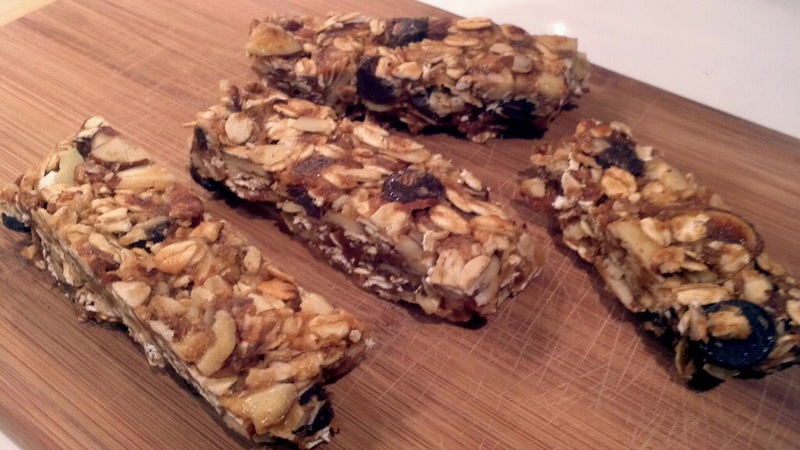 These granola bars are easy to make and can be stored in the freezer to maintain freshness. I've tried making no bake bars with oats before and I disliked the chalkiness of the uncooked oats, so toasted oats seemed to be the solution to this problem. Preheat oven to 350 degrees F. Pour oats evenly across a cookie sheet and bake for 15 minutes, until oats are lightly toasted. Remove from oven and set aside to cool. In a food processor, chop the dates until a paste forms. Pour paste into a large mixing bowl. Add toasted oats, sliced almonds and chocolate chips to the bowl and mix. In a small saucepan, combine peanut butter and maple syrup and set to low heat, stirring frequently. When mixture is uniform in appearance, pour into mixing bowl and stir to coat oat mixture. Line a 7x9 or 8x8 inch pan with waxed paper. Pour contents of mixing bowl into lined pan and press contents down firmly. Use an additional sheet of waxed paper to place over top to press down to flatten. Freeze for one hour, carefully remove contents from pan and slice into bars.